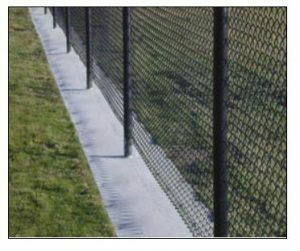 WeedEnder® Fence Barrier is designed to control the growth of unwanted vegetation in an environmentally safe manner. This is accomplished without adding to your runoff problems, as would be the case when using asphalt, concrete, or other nonporous weed-control methods. These rolls are perfect to run underneath new or existing chain link fences, electric fences, or even decorative wooden fences. The rolls have punch-outs for new installation of fencing, or non-punched for existing fence lines and post holes punched and slit on site. This enables you to open a roll at each fence post and slide WeedEnder around the post. The punch-out in these rolls is slightly larger than the actual size of your fence post and centered in the width unless otherwise specified. And although post spacing varies by type of fence or terrain, we can accommodate any consistent spacing, or you can cut the holes for the fence posts during installation. The rolls are available in different lengths and widths. The standard width is 2′; the standard length is 250′. This length may vary because of the millrun when the material is originally made. Each roll will be clearly marked with the exact footage, and your order will total the correct length. You may also order odd-size lengths to fit specific needs. Also, these rolls may be joined together for longer lengths.